Whites' Lemonade was first produced in 1845 by Robert and Mary White, who sold homebrewed ginger beer from a barrow in Camberwell, London. 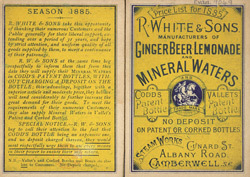 By 1888, the year of publication of this leaflet, their business had merged with the large Whitbread brewery and they continued to sell lemonade, ginger beer and mineral water. Lemonade was sold in stone bottles but other fizzy drinks were sold in glass bottles called 'Codds', named after their inventor Hyram Codd. These had marbles in their necks, which acted as stoppers and kept the drinks fresh. The Whites' company was bought by HD Rawlings in 1891, who delivered the lemonade beyond Britain to the royal houses of Europe.